Recombinant full length protein corresponding to Human SOX2 aa 1-317. Expressed in bacteria. 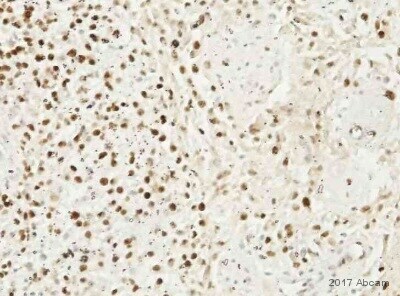 IHC-P: Human lung squamous carcinoma tissue. Mouse esophagus tissue. ICC/IF: H9 embryonic stem cells. HEL 11.4 induced IPS cells. IP: NCCIT whole cell lysate. WB: NCCIT and NTERRA cell lysate. Flow Cytometry: H9 embryonic stem cells. HEL 11.4 induced IPS cells. Our Abpromise guarantee covers the use of ab171380 in the following tested applications. IP Use at 5 µg/mg of lysate. WB 1/1000 - 1/2000. Predicted molecular weight: 34 kDa. Immunohistochemistry analysis of SOX2 showing staining in the nucleus of paraffin-treated human lung squamous carcinoma (right) compared with a negative control without primary antibody (left). To expose target proteins, antigen retrieval was performed using 10 mM sodium citrate (pH 6.0), microwaved for 8-15 minutes. Following antigen retrieval, tissues were blocked in 3% H2O2-methanol for 15 minutes at room temperature, washed with ddH2O and PBS, and then probed with a SOX2 monoclonal antibody (ab171380) diluted by 3% BSA-PBS at a dilution of 1:200 overnight at 4°C in a humidified chamber. Tissues were washed extensively in PBST and detection was performed using an HRP-conjugated secondary antibody followed by colorimetric detection using a DAB kit. Tissues were counterstained with hematoxylin and dehydrated with ethanol and xylene to prep for mounting. Immunofluorescence analysis of formaldehyde-fixed H9 embryonic stem cells, labeling SOX2 using ab171380 (left panel) at a 1/200 dilution overnight. DAPI was used to stain the cell nuclei (central panel). Slides were washed with PBS and incubated with a fluorescein-conjugated secondary antibody at a 1/100 dilution. Western blot analysis on immunoprecipitation pellet from NCCIT (Human pluripotent embryonic carcinoma cell line) cells. The antigen-antibody complex was formed by incubating 500 µg of NCCIT whole cell lysate with 5 µg of ab171380 overnight at 4°C. The immune-complex was then captured on 50 µl Protein A/G Plus Agarose. Captured immune-complexes were then washes extensively and eluted sample with loading dye (lane 1) or 25 µg of NCCIT whole cells lysate (lane 2) were resolved on a SDS PAGE gel. An anti-mouse IgG-HRP secondary antibody at a 1/10,000 dilution was incubated for at least 1 hour. Chemiluminescent detection was perfomed. Flow cytometry analysis of H9 embryonic stem cells labeling SOX2 (blue histogram), using ab171380 at a 1/100 dilution, or a mouse IgG (green histogram) at a 1/100 dilution. A fluorescein-conjugated secondary antibody at a 1/200 dilution was used for the analysis. Immunofluorescence analysis of formaldehyde-fixed HEL 11.4 induced IPS cells, labeling SOX2 using ab171380 (left panel) at a 1/200 dilution overnight. DAPI was used to stain the cell nuclei (central panel). Slides were washed with PBS and incubated with a fluorescein-conjugated secondary antibody at a 1/100 dilution. Immunohistochemistry analysis of SOX2 showing staining in the nucleus of paraffin-treated mouse esophagus tissue (right) compared with a negative control without primary antibody (left). To expose target proteins, antigen retrieval was performed using 10 mM sodium citrate (pH 6.0), microwaved for 8-15 minutes. Following antigen retrieval, tissues were blocked in 3% H2O2-methanol for 15 minutes at room temperature, washed with ddH2O and PBS, and then probed with a SOX2 monoclonal antibody (ab171380) diluted by 3% BSA-PBS at a dilution of 1:20 overnight at 4°C in a humidified chamber. Tissues were washed extensively in PBST and detection was performed using an HRP-conjugated secondary antibody followed by colorimetric detection using a DAB kit. Tissues were counterstained with hematoxylin and dehydrated with ethanol and xylene to prep for mounting. Flow cytometry analysis of HEL 11.4 induced IPS cells labeling SOX2 (blue histogram), using ab171380 at a 1/100 dilution, or a mouse IgG (green histogram) at a 1/100 dilution. A fluorescein-conjugated secondary antibody at a 1/200 dilution was used for the analysis. Publishing research using ab171380? Please let us know so that we can cite the reference in this datasheet.